Over the weekend I stopped in at Gilman Brewing, on Gilman St, in Berkeley. The space is fairly cozy. One is greeted by the taproom immediately upon entering, in a small, low-ceiling foyer, leading onto a passage backed by a long standing bar pushed up against the backside of the fermenters. 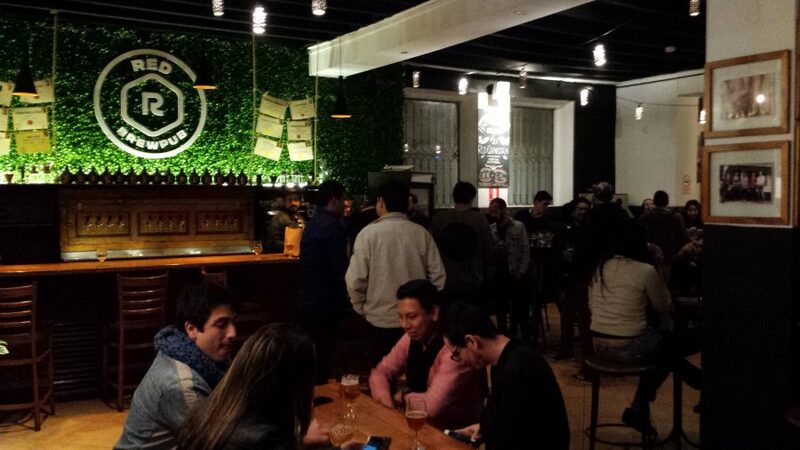 However, above there is a two-level deck overlooking the brewhouse, with a selection of tables and bar stools. Off to one side there is a game room, with corn-hole, and -I think- a fussball table. s for my flight. 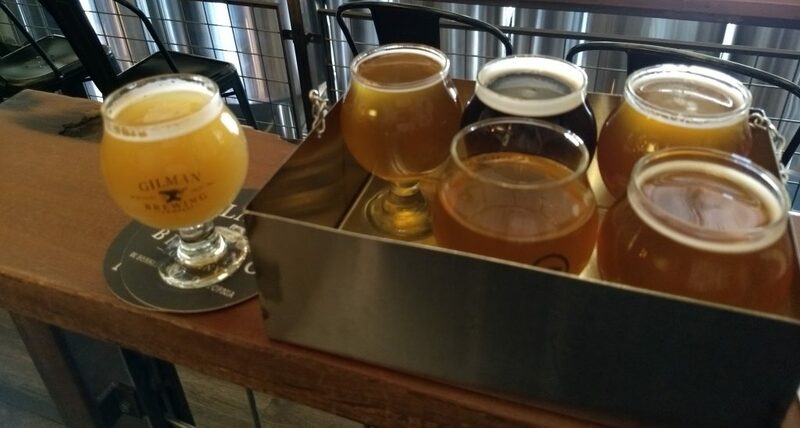 I tried (clockwise from top center, in the picture above) La Ferme Noire (dark saison with brett, 7.7% abv), Old Rusty (Belgian golden strong, 8%), Pineapple Jardin (Belgian golden sour, 5.8%), Cheval de Fer (limited-release dry-hopped Belgian saison, abv not specified), and Fuzzy Dice (hazy IPA, 7%). I liked all the beers, but I was kind of rushed and didn’t take notes, so I can’t remember details of all of them. Fuzzy Dice was good, I do remember that. So were Cheval de Fer and Old Rusty, but, for me that day, the real standouts were the two sours. Le Jardin is a kettle sour, which means that it was soured with lactobacillus before the wort was boiled. It is dry, and mildly tart, not puckeringly sour, which makes it a good “gateway” into the world of sour beers. That it was then fermented with Belgian yeast strains adds pleasant complexity to the flavor -some citrus, stonefruit, …. 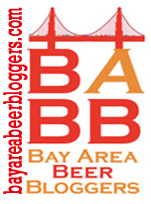 It is no wonder that I liked it, as I am partial to both, sours and Belgian-styled beers. Pineapple Jardin is Le Jardin with the addition of a half-ton of fresh pineapple per batch. So, take what I said above about Le Jardin and picture that with the sweetness and tartness of pineapple, with loads of pineapple flavor on top of that, and you’d be getting the picture. 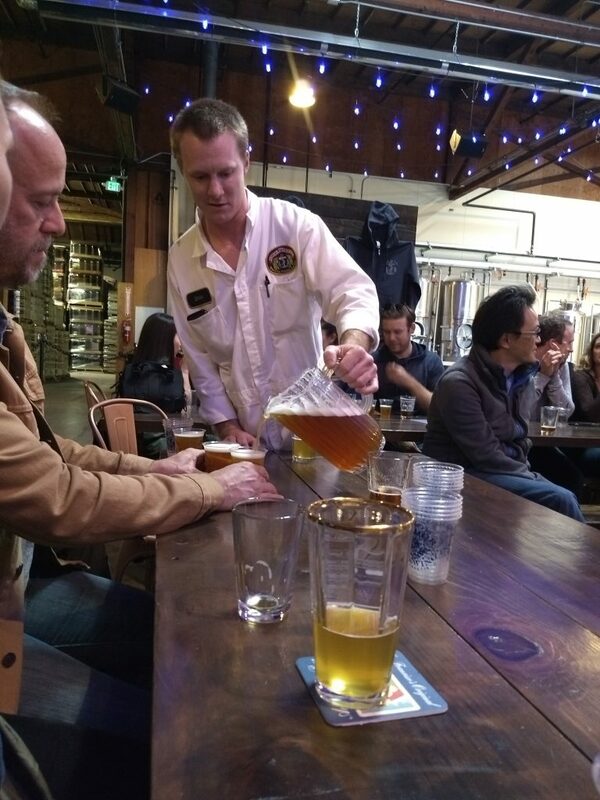 About a week and a half ago, took advantage of invitation to attend an Autumn Beer Tasting Session led by Dane Volek, Anchor’s Pilot Brewer at Anchor Public Taps. 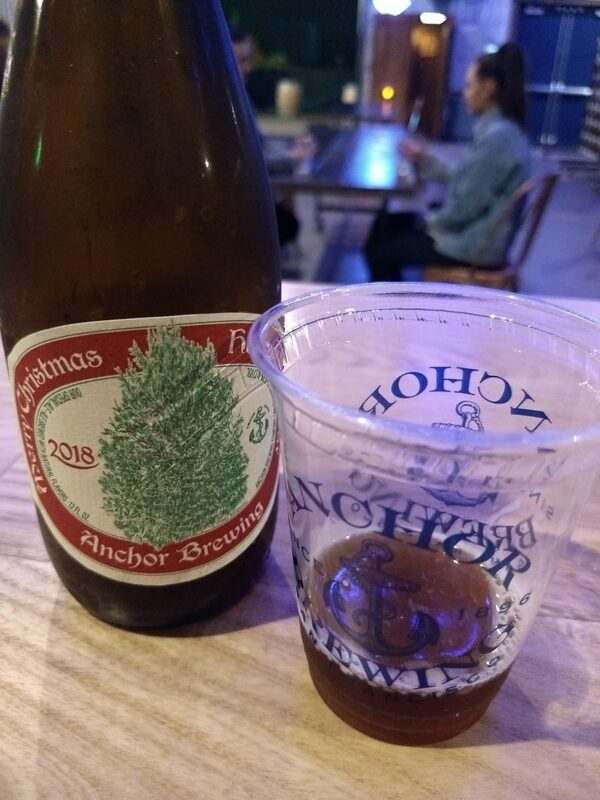 Up until now Anchor’s tap room has not been generally open to the public, and the only way to taste Anchor beer at the brewery was to attend a special event or manage to grab a hard-to-get spots on a tour. Anchor’s new taproom, Anchor Public Taps, changes that by being open 7 days a week and offering pretty much all of Anchor’s beers on tap to the public, hence the name “Public Taps”. 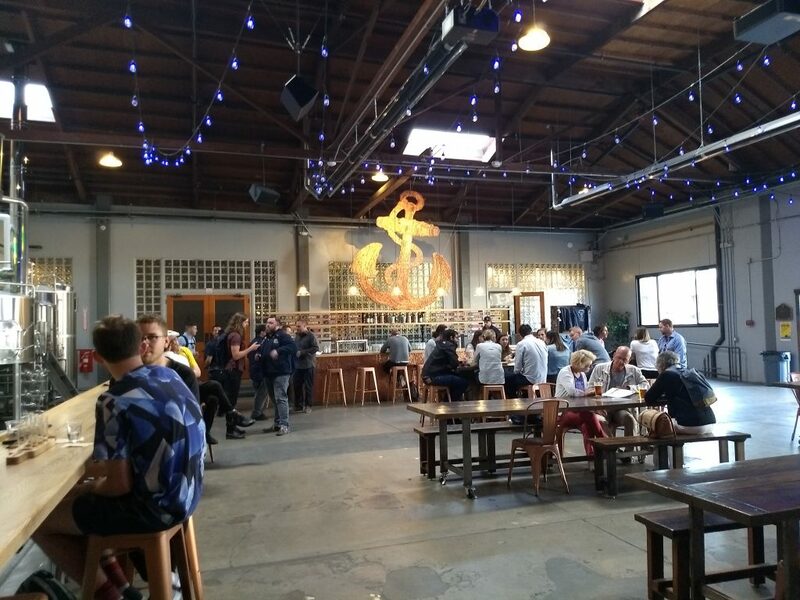 Located just across the street from the main Anchor brewery itself on Potrero Hill in San Francisco, Anchor Public Taps also houses Anchor Brewing’s 7-bbl pilot brewery, which produces many beers offered only on tap, and only at Anchor Public Taps. In addition it also hosts Anchor’s growing barrel-aging program, including some “funky” barrels. 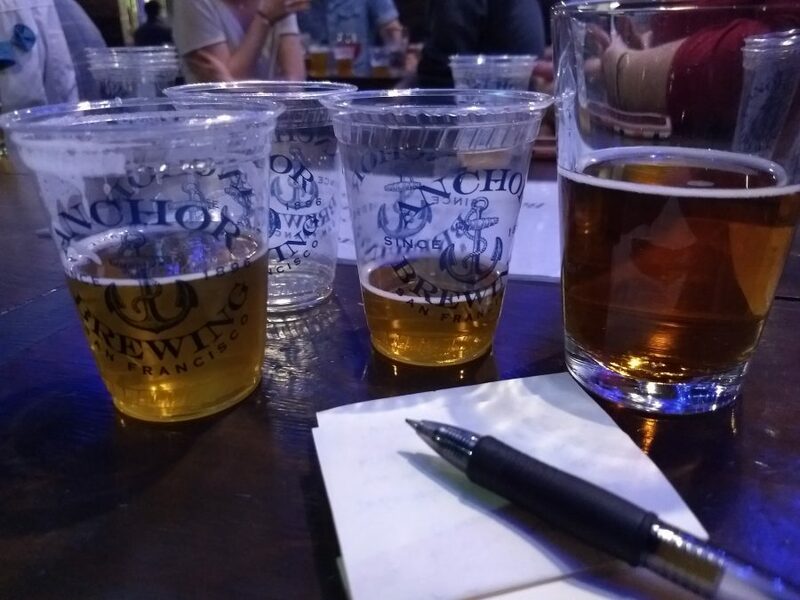 Volek led our group through a line-up of four beers that “you would want to drink on an evening in the Fall”. triple IPA 9.3% fruitiness in the nose: citrus and then … strawberries! Marked strawberry character in the flavour as well. Hop bitterness is attenuated by the sweetness. The sweetness lingers on the palate, leaving a sharp bitterness as it fades. Very interesting beer. Pronounced coffee notes in the aroma and taste. Coffee, roast, and hop bitterness balanced by malty sweetness. In addition to those four, Volek threw in a few additions and surprises. The first of these was a Märzen, of which we got serve ourselvesdirectly from the sampling port on the fermenter. Next, the group was able to taste a brown ale that had been fermenting for only 24 hours. It pretty much was like tasting unconverted wort –which is, in fact, what it was. Finally, we got a preview taste of this year’s Merry Christmas and Happy New Year beer and a sneak peek at the label and packaging. This past weekend I traveled from Lima to the city of Ayacucho (aka Huamanga), where my family is originally from, on my dad’s side. 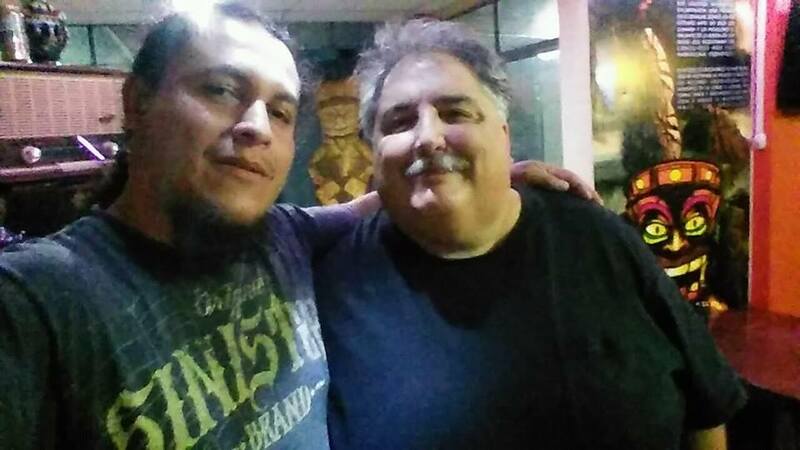 There, I had a great time meeting Richy Ledesma, a craft brewer whom I’d been in contact with on FaceBook and who is also friends with a couple of my cousins. 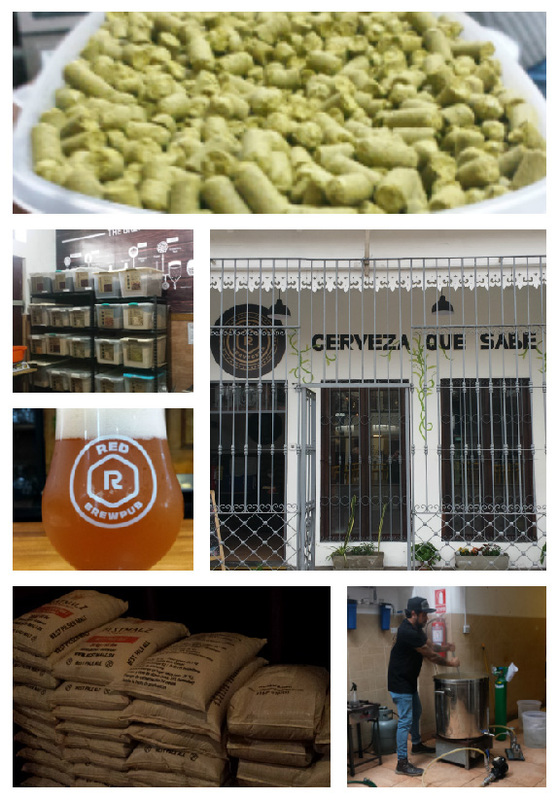 Richy received me at his place, Cervecería Artesanal El Oráculo, and plied me with beers as we spent the evening talking about craft beer and other subjects. 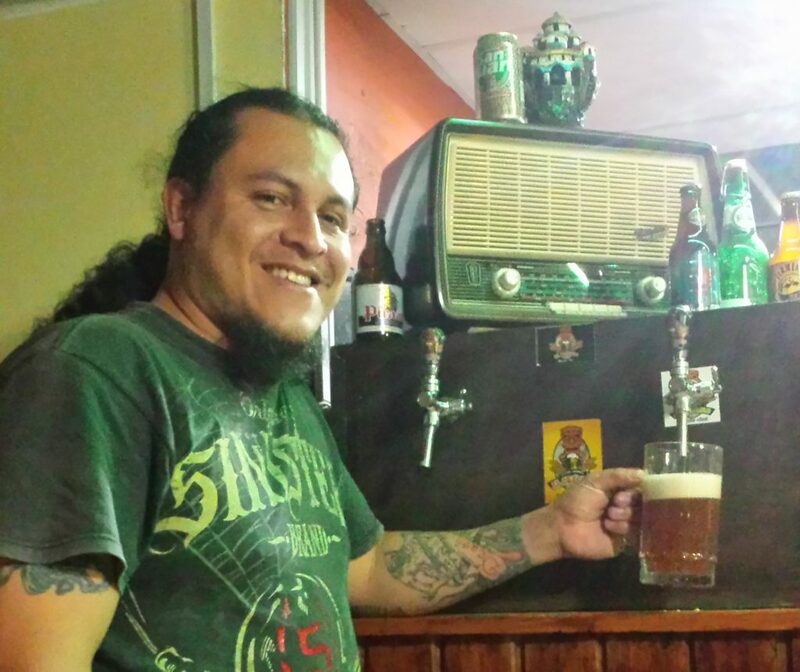 Entirely self-taught, Richy is one of only two craft brewers in Ayacucho, a city 363 road miles from Lima and 9,000 feet up in the Andes. He produces four or five batches a week on a 100-liter system, which he mainly distributes in bottles, which he fills by hand and carbonates with priming sugar. In the evenings he opens his little taproom, which is located in a fourth floor walk-up space in downtown, and dispenses beer from his two-tap draft system. The relative isolation means that everything that goes into a beer but the water, has to be imported. Once to Peru, and thence from Lima to Huamanga. It also means that Richy is fighting against a lack of popular knowledge about beer styles and about hand-crafted beer. Further, it also means that Richy does not have easy access to examples of the styles he wishes to brew nor to a support community of fellow brewers. One result of that is that some of El Oráculo’s beers are not quite consistent with what we, in the US, would consider the standard for those beers –for example, Punana Porter falls a bit shy when it comes to body and mouthfeel. Richy, however, is undaunted and by dint of hard work in what is essentially a one-man operation, he is opening doors for his brews in town and elsewhere. 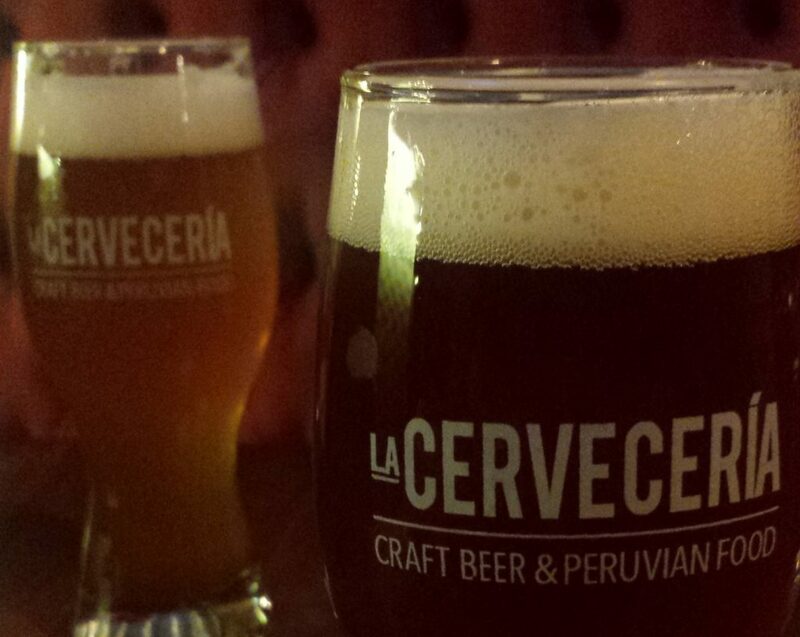 His beers are even poured at events and festivals as far away as Lima. 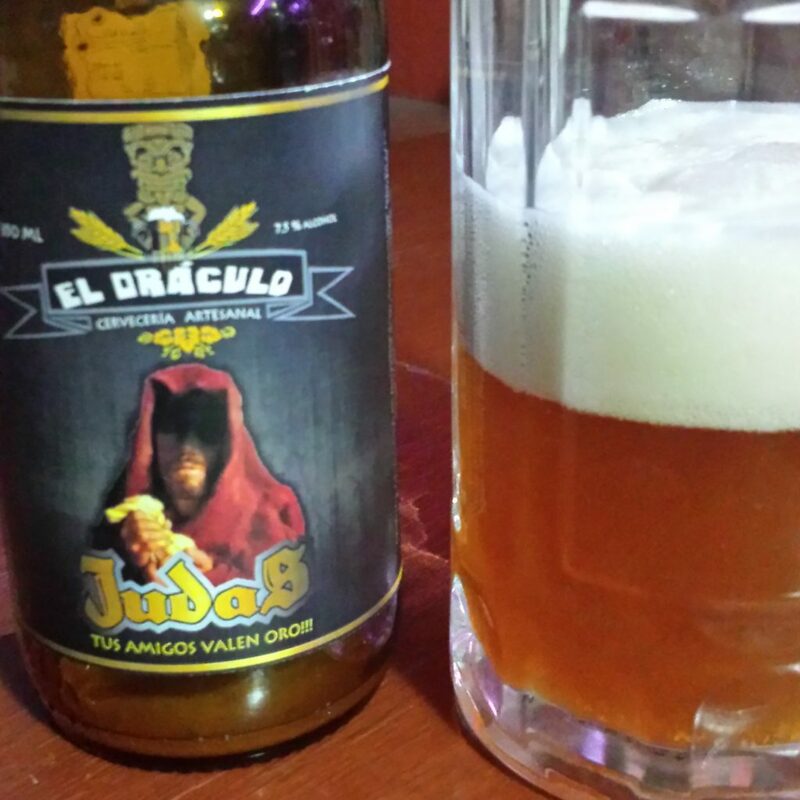 El Oráculo’s tastiest beers are, by far, Judas and La Vidente. Judas is a 7.5% abv, 30 IBU, 13 SRM, smooth pale ale with a lovely white head. I didn’t take any notes, so I’m going from memory here, but I believe Richy said that he used Columbus and Kent Goldings hops in this one. La Vidente is El Oráculo’s biggest beer, coming in at 13% abv. One wouldn’t know it, though, when drinking it. It has a bit of warmth, but is not “hot” with alcohol. Rather, tropical fruit notes predominate in the mouth and nose. 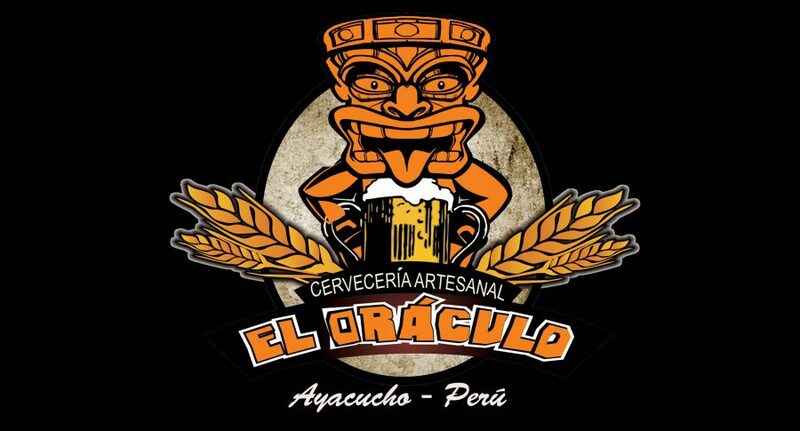 If you like craft beer and supporting small independent enterprises, El Oráculo is well worth checking out should you find yourself in Ayacucho.